Weather forces the postponement of several MLB games on Sunday, including the first game of a double header between the New York Yankees and Detroit Tigers. 202 games have gone by since Joey Votto last missed a game, the Reds veteran is ready to put this one in the rear view mirror. 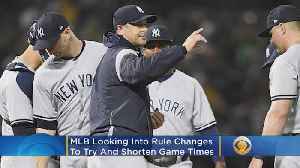 MLB and MLBPA are looking at instituting a pitch clock and restricting mound visits as ways to speed up baseball games and add excitement. Gilma Avalos reports.